How to Make a Terrarium in a Bottle | Make A Terrarium! Similar to a ship in a bottle, a terrarium in a bottle can make a fascinating centerpiece. It's a little easier to do than a ship in a bottle also. You can use any kind of clear bottle you want. Glass is the best, but plastic will also work as long as it doesn't discolor. The larger the bottle's opening, the easier time you will have arranging everything. If you're up for a challenge though, a terrarium with a small opening can be intriguing to look at. Consider trying a clear wine bottle or soda bottle. Liquor bottles tend to be a little fancier, and can make a beautiful enclosure. Once you've picked out your bottle, wash it out thoroughly. You don't want any food particles that will grow mold. Dry it out thoroughly too. This will help keep dirt from sticking to the sides of the bottle. Choose small plants that will fit in the hole of the bottle, and won't outgrow the container. You can also start with seeds if the container opening is too small to fit a plant through. 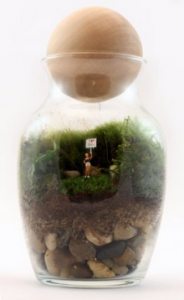 Try to think of a theme or small scene to create in your terrarium bottle. Once you have an idea, arrange the plants and decorations outside the bottle first. This makes it easier to move them around until you find an arrangement you like. When you're happy with the arrangement, it's time to start building the terrarium. Bottle terrariums are set up the same way as a normal terrarium. For detailed instructions, see the tutorial here. If your container's opening is very small, you might have to use a small spoon to insert all the ingredients. A funnel made out of a rolled up piece of paper can also help when adding rocks and dirt. First, add a 1 inch layer of small pebbles or gravel to the bottom of the bottle. This creates a place for excess water to drain so your plants aren't sitting in water. Add a thin layer of activated charcoal on top of that, then a thin layer of sphagnum moss. The charcoal discourages mold growth, and the moss acts as a net to keep your soil from washing down into the rocks. Put down 2-3 inches of soil next. Now you're ready to add your plants. Use a coat hanger or chop sticks to gently stick the plants into the soil. Add enough soil around them so the roots are completely covered. Then add some rocks, moss, or decorative pieces on top to complete your scene. If some of the dirt got stuck on the walls of the bottle, wipe it off with a cloth or small sponge piece attached to a chop stick. Add a little water (not too much! ), and your terrarium is ready to go. If your bottle is closed, you don't need to water it very often, only once a month or so. If it looks like a lot of water is condensing on the sides of the bottle, you might have too much water in there. In that case, open up the bottle and let it air out for a few hours. Don't fertilize the plants either. This will keep the plants from growing too big for the bottle. Place the bottle in indirect sunlight. Make sure it gets enough sun, but don't put it directly in the window or you might scorch your plants. With a little practice and some patience, your terrarium in a bottle will be thriving in no time!